I've been away a lot this month, I know. My apologies. Been a crazy busy month for me, especially since a lot is riding on this one event that is scheduled for Saturday. And while I'm trying my best to blog whenever I get a bit of free time, I've also had to depend on my a little help from my friends. This month, I've asked my friend Sangeeta Khanna to do a guest post for me. In case you've missed out on me mentioning her every couple of posts, please know she's absolutely one of my favourite persons in the blogosphere (and otherwise). I've spent many a dinners with her and hours chatting on our cubby hole on Facebook just talking about each others lives. 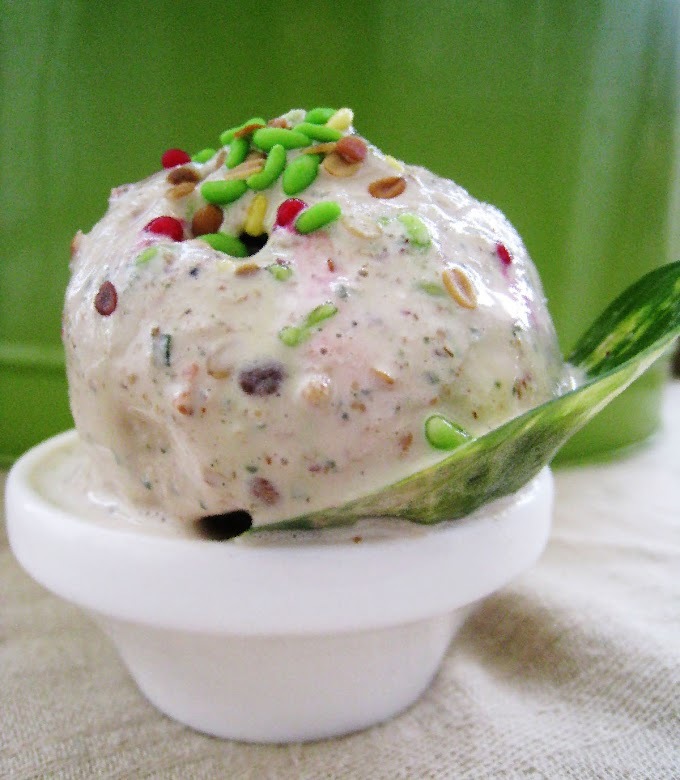 But that said, she runs two absolutely fantastic blogs Health Food Desi Videshi and Banaras Ka Khana. And she's the one who's making sure I eat right everyday. 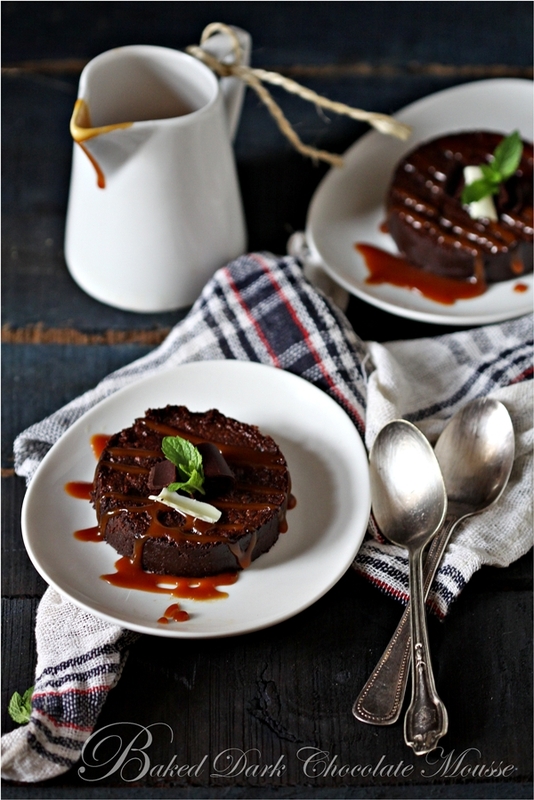 So for her guest post, I asked her to share some super healthy seasonal recipes. And she's done exactly that - two amazing smoothie recipes that totally hit the spot. Thank you Ruchira for having me over. I have been reading your blog almost since it's birth I guess, the creative recipes at Cookaroo are awe inspiring. I have had the pleasure of eating many of your stuff and it was finger licking good every single time. The dips and spreads you make are so diverse, your desserts are so beautifully executed. It is my pleasure to share a couple of quick smoothie type recipes at Cookaroo, I hope you and your readers enjoy the recipes as much I do. Smoothies make great meals or snacks. You can customise your smoothies for the day, the season, your mood or current requirement of macro nutrients or whatever micro nutrients you wish. The best thing about smoothies is, you mostly do it with raw ingredients and the meal is ready in almost 5 minutes. I add all sorts of ingredients into my smoothies, from yogurt, milk, coconut milk or soy milk to cooked oats or alternate grains, all sorts of fruits and vegetables and even aromatic herbs. I often add ginger to my smoothies for the anti inflammatory benefits it brings. Combining ginger with pineapple gives you great results if you are suffering from post workout muscles aches. Protein enriched smoothies will be great for a post workout meal while a fruity and herb infused smoothie will be great to perk you up on a summer morning. 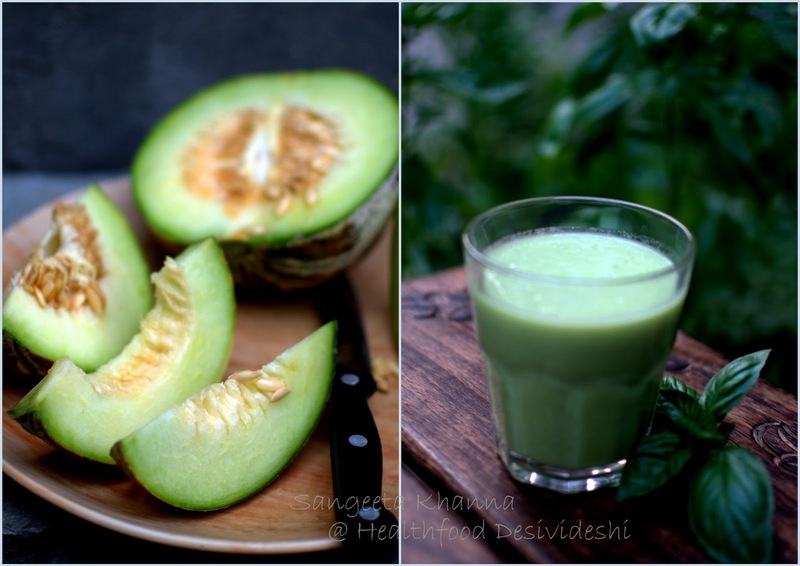 This musk melon and sweet basil smoothie is such a pleasure to have chilled in afternoons, if not for breakfast. The time when you start feeling worn out after half of the days work. The basil soothes your senses and melon hydrates your system. I have added coconut milk to this smoothie to keep it aromatic and to supplement you with good fats for the day. 1. Blend the musk melon pieces and torn basil into your blender first, make a smooth paste. 2. Add the coconut milk and blend again for a couple of seconds. Take care not to blend too much after adding the coconut milk as the fat would start getting separated. Not that it will become bad in taste, the white fat globules are not a good sight and they take away the flavor from the smoothie. 3. Enjoy chilled. This smoothie can also be turned into a sorbet if you wish. 4. Use everything frozen and give it a good blend and serve immediately. 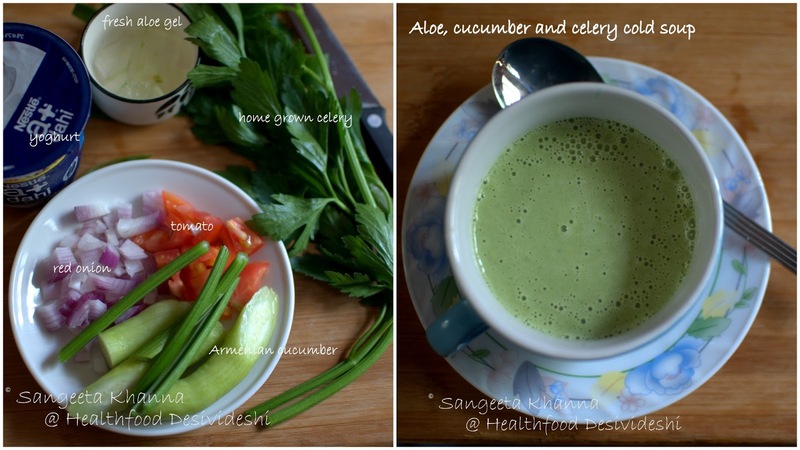 Here is another smoothie recipe which is savory and hence makes a nice cold soup. almost like gazpacho but very delicately flavored and refreshing. perfect for summers. Using all the ingredients chilled works well to get a nicely cold smoothie instantly, otherwise chill before serving, it stays well for a couple of hours. 1. Blend the onions, tomatoes, celery stalk and leaves first without adding water. Make a smooth paste so there are no bits and pieces. Add the chopped cucumber and blend again to a smooth paste. 2. Add the yogurt and salt, blend very briefly again to mix thoroughly. 3. Serve cold or chilled with or without a drizzle of EVOO. 4. The flavors are amazingly aromatic with celery, cucumber lends a nice cooling feel while the tomatoes and onion bring the right amount of tang, very subtle but something that complements the base flavors. 5. Enjoy with a garlic bread stick, a cracker or with a grilled main course or just have it as a refreshing snack. 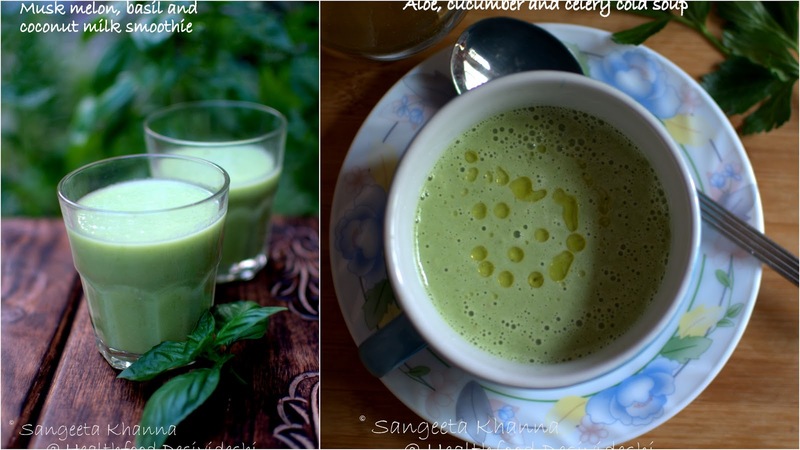 Lovely combinations, want to try the muskmelon and basil combo soon! And thank you Sushmita, come home I'll make basil and musk melon smoothie for you. Super chilled. I want some now. love the idea of green smoithies. So uplifting. The first one is on my list to do tmrw....the second will need to wait coz my celery died. Yummmmm recipes.